Page added in October 2015. Photos taken in September 2015 with Canon Powershot SX 700 HS. 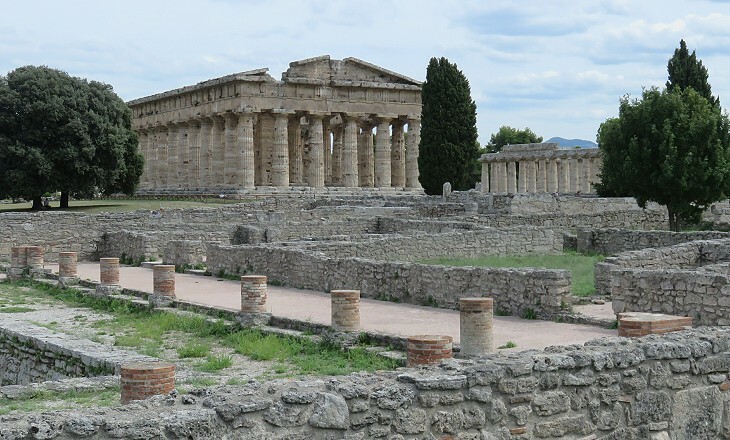 Archaeologists were rather surprised when they unearthed a large IIIrd century AD (or later) residential complex which run from the southern to the northern walls immediately to the west of the monumental area of Paestum. 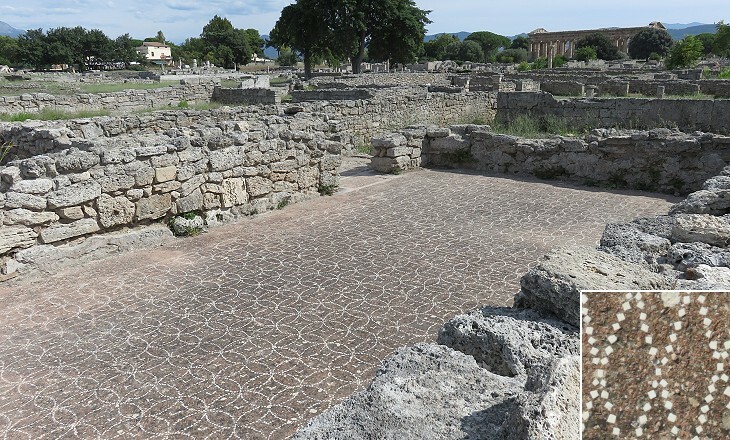 At Ostia or Pompeii shops, inns, small baths and workshops were interspersed in housing districts, but this did not occur to the same extent at Paestum. 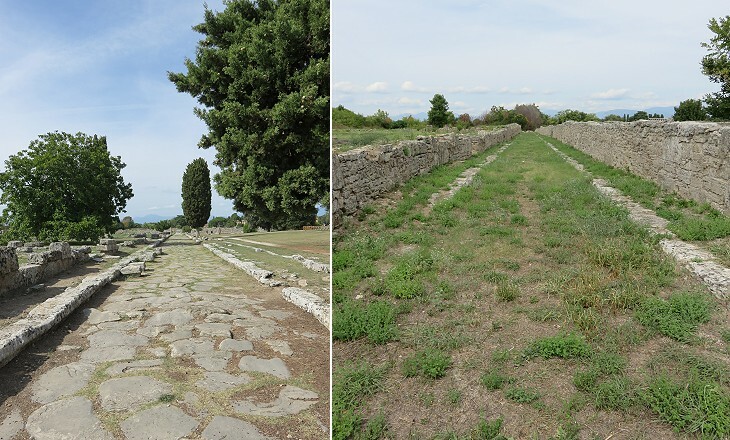 A well preserved Roman street crossing Paestum from south to north has been called Via Sacra, but Cardo Maximus (main south-north oriented street) would be a more appropriate name. Its southern section was flanked by the rear sides of the southern temples on the east and on the west by an uninterrupted row of houses. This suggests that in the late Empire, Paestum was a rather quiet place and not particularly bustling with life. The houses were built in a very orderly manner along three parallel streets. When the residential quarter was designed most likely the houses had more or less the same size. Eventually one of them was greatly enlarged to the detriment of the neighbouring ones. It covers an area of 2,500 sq mt/27,000 sq ft and it is centred around a large pool. 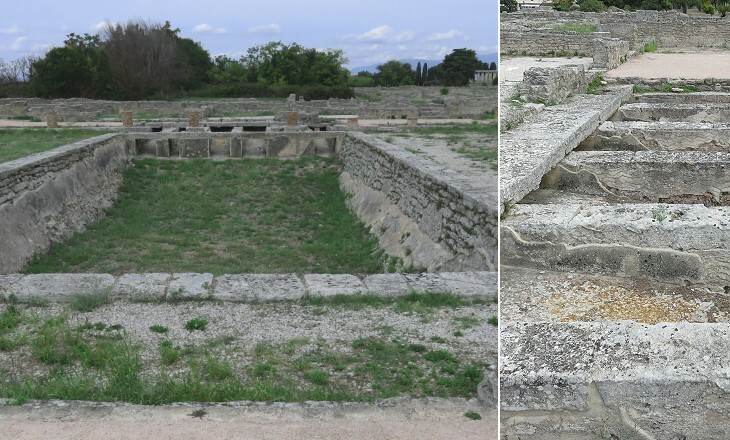 Its use for swimming is rather unlikely, although the climate of Paestum would have allowed swimming for many months of the year. The tablinum was the public part of the house where the landlord received his friends and it was situated near the entrance. 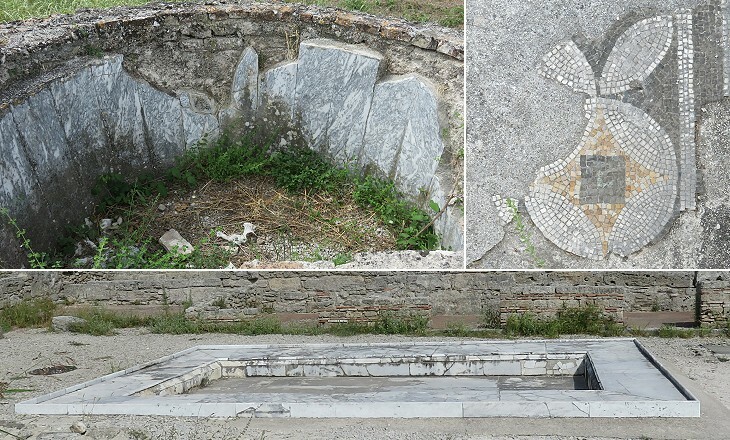 Rainwater was collected in the impluvium and stored in an underground cistern, but over time the impluvium became just a decorative element of the tablinum. The houses or at least most of them had an upper storey. 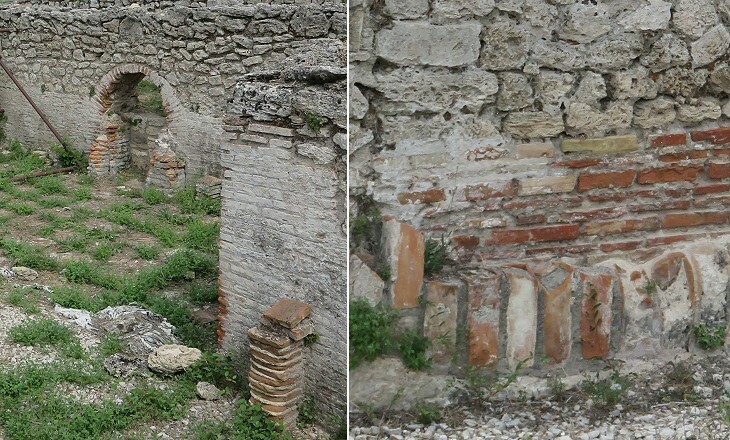 Scanty remains of public baths have been identified along Via Sacra opposite the residential quarter. The wealthy inhabitants of some houses however did not need to cross the street to go to the baths as they had them at home. The walls and the vaults of these private establishments have disappeared, but their existence is proved by the finding of underground furnaces, low brick pillars which supported a heated floor and wall flues for the circulation of hot air. What is there that human industry will not devise? Even broken pottery has been utilized; it being found that, beaten to powder, and tempered with lime, it becomes more solid and durable than other substances of a similar nature; forming the cement known as the "Signine" composition, so extensively employed for even making the pavements of houses. The Romans widely employed geometric black and white mosaics for the floors of their houses (as at Villa Adriana), but this type of decoration was perhaps too expensive for the landlords of Paestum. They opted for a cheaper material, but did not forego its decoration. The image used as background for this page shows another floor with a Greek key pattern design. 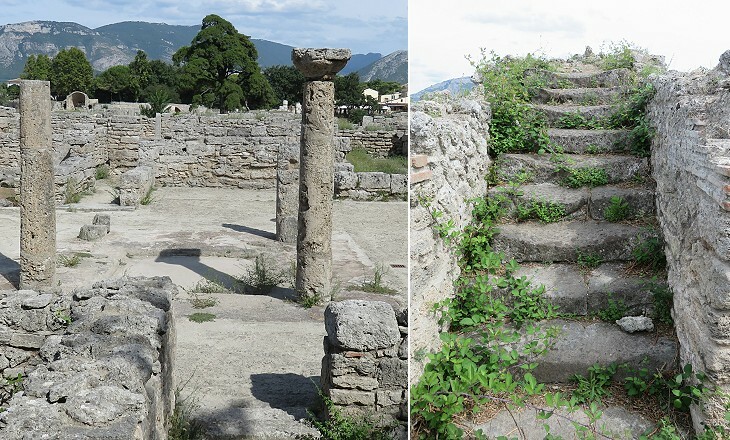 The use of marbles was widespread in the Roman Empire especially in the IInd century AD, but archaeologists have found very limited evidence of them at Paestum, a fact which with many others indicate that the town had lost the importance it had at the time its temples were built.